It seems to me that people got tired of traditional kind of fun such as bowling, karaoke and shooting pool. 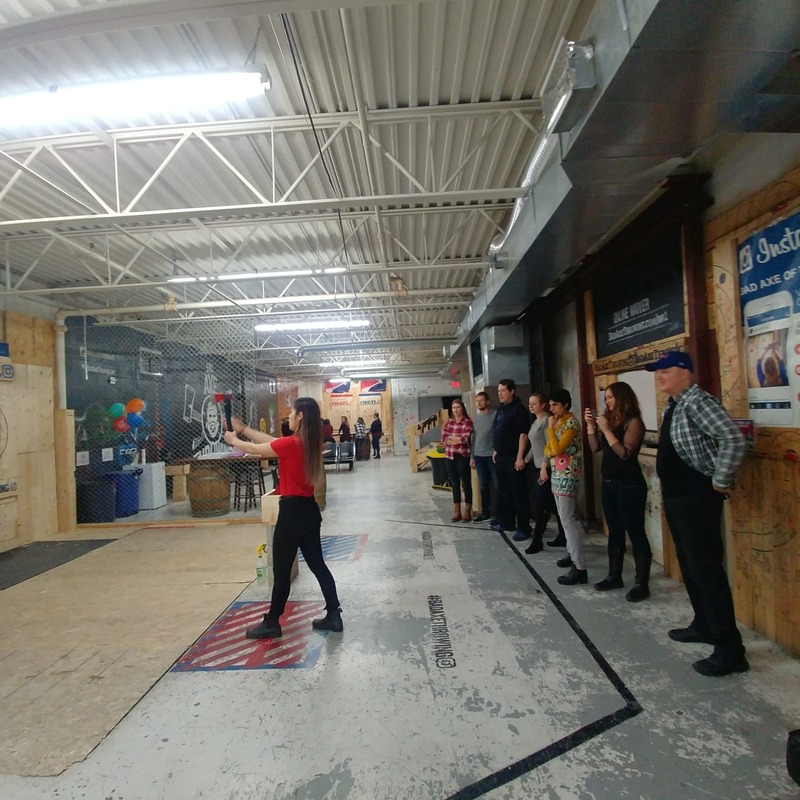 That is why axe throwing is becoming more and more popular these days. You can even sign up to be in a winter league. 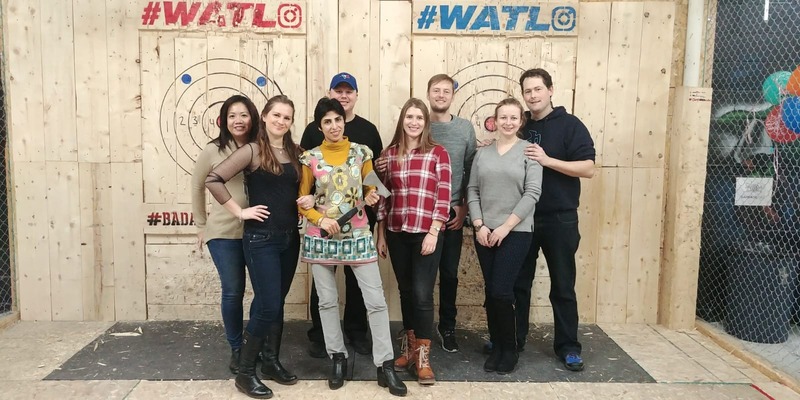 I decided to gather my friends and try one of the axe throwing places for my birthday party in Toronto - Bad Axe Throwing. When my buddies received an electronic waiver to sign, they were hesitant as it says "risk of serious injury or death". Everyone turned out happy in the end though. By the way, it is free for the Birthday girl/boy with a proper ID. You are allowed to bring your own food and drinks. We had cake and snacks as there is a table provided for the party. It's best to have an even number of guests because only two people can play at the same time. Meanwhile, whoever is not playing can simply hang out and take pictures. In this traditionally "macho" sport, there was an equal amount of male and female throwing axes. 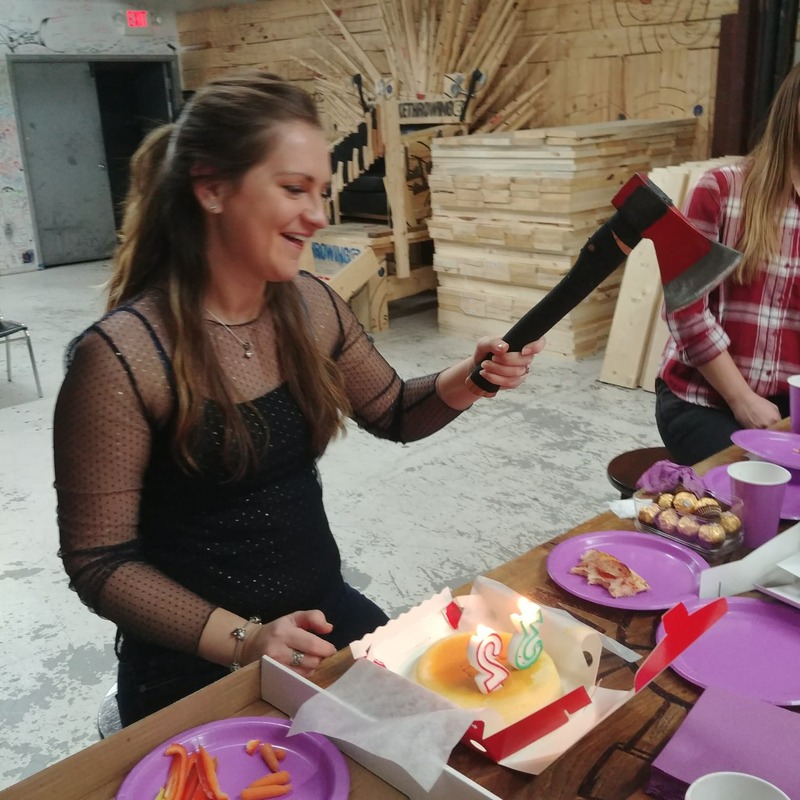 That should not surprise anyone considering that first axe throwing place in the US was opened by the 35 year old woman. It costs around 40 CAD per person and it is truly a great exercise. Think about when was the last time you picked up something fairly heavy and threw it across the room. Sounds fun, doesn’t it? You have your own dedicated coach who explains how to throw an axe into a bullseye with the choice of four different kinds of axes. Later the coach divides you into teams, shows you different games which is a lot of fun especially when it comes to girls vs guys. 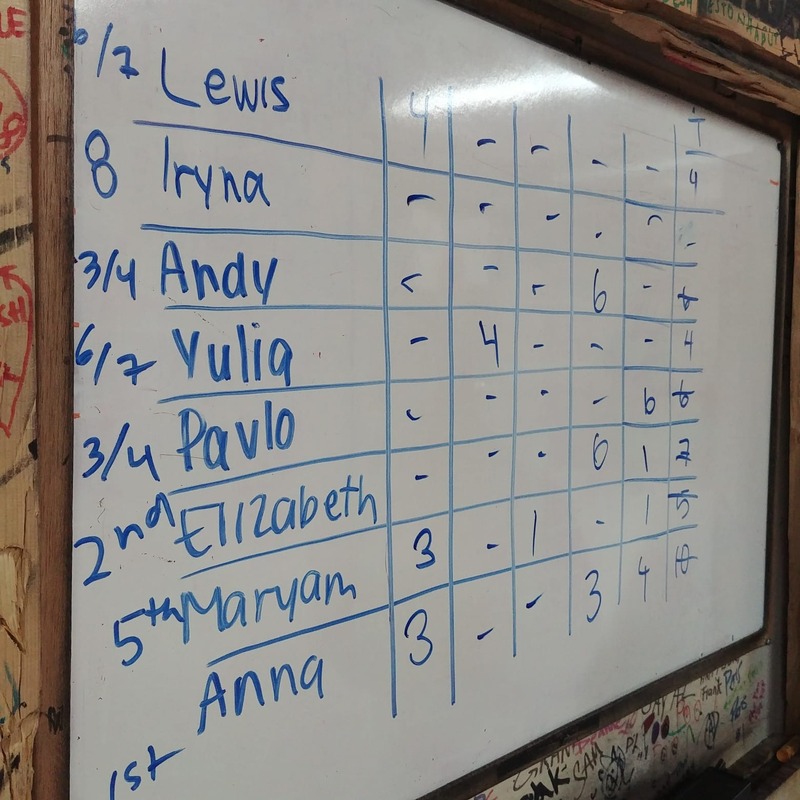 The coach keeps the score for your convenience. 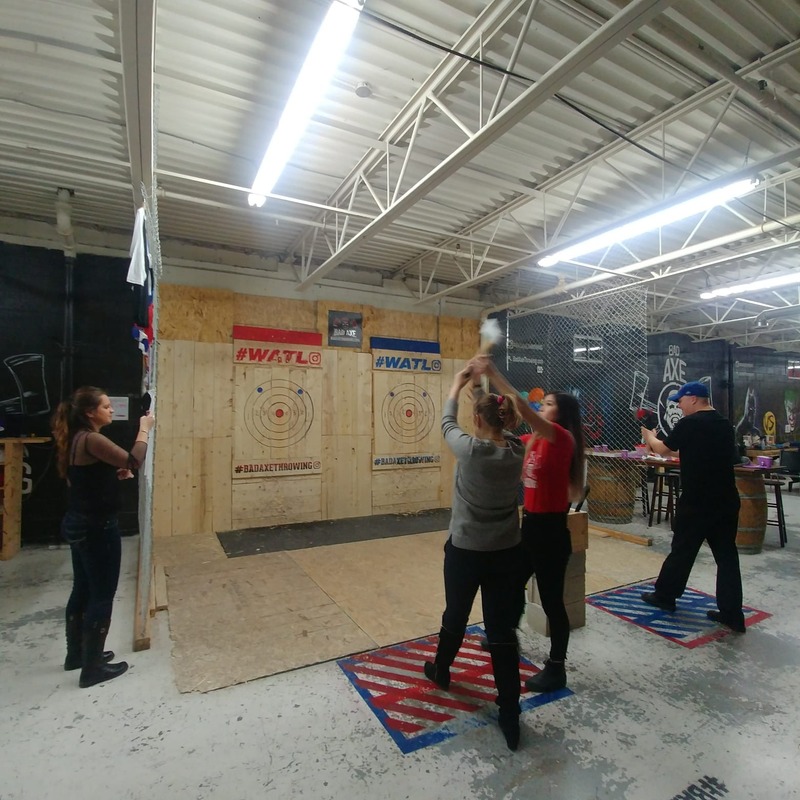 The entire process lasts two and a half hours, and the main rule is to wait until your partner on the parallel lane finishes throwing his or her axe before running to pick up your axe from the target area. You have the freedom to throw axe with right hand or left hand, you can even throw two axes at the same time if your lumberjack soul decides to do so. By the way, wooden targets are being replaced after each gaming session, this way it is new and hard to stick an axe into. At some point my birthday balloons were attached to the target area and I had the honor of breaking into a new year of my life through popping them with a flying sharp object. 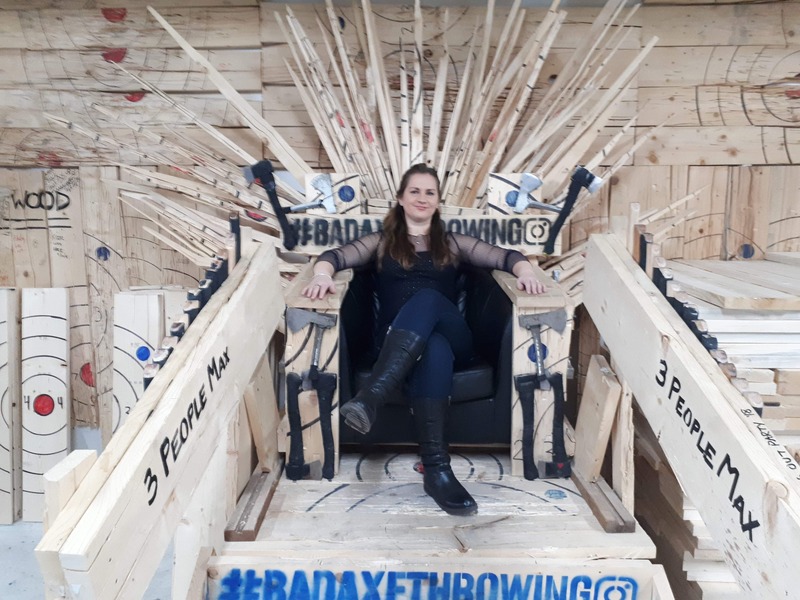 There is also this cool throne made of wood and axes that you can relax on. It gives you some sort of Game of Thrones feeling that is missing in everyday life. People come here for a date, bachelor party, birthday party or corporate events. After all, humans were made to move and not to sit in front of computers all day. It is in our DNA to chop woods for the winter to stay warm, to build houses and to cook on wood stove. 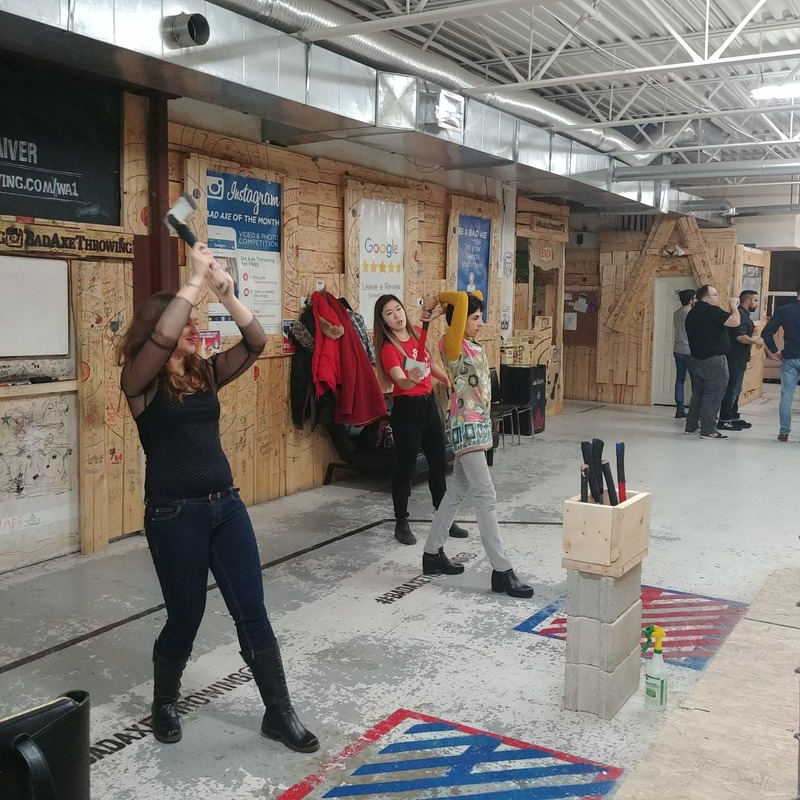 Living in urban societies didn't change who we really are and that's why axe throwing is becoming such a popular activity not just in Canada but globally.